Whilst fusiform cells are primarily responsible for the formation of the conducting elements in the axial system, ray initials are principally involved in the formation of ray tissues (horizontally-orientated), for the lateral (radial) transfer of assimilates from the phloem towards the living parenchymatous elements nearer the middle of the stem, as well as the centrifugal transport of water from the xylem to the phloem and associated vascular parenchyma elements. Click here to see details of the periderm and a lenticel. The Quercus stem shown here, has undergone considerable secondary growth. Note that the epidermis is no longer present, and that its protective function has been taken over by the periderm. 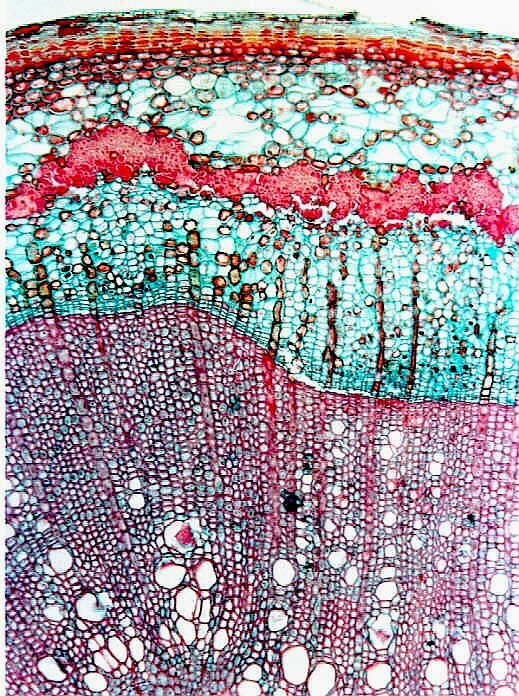 The micrograph above, shows that the phloem is is capped by secondary phloem fibres. 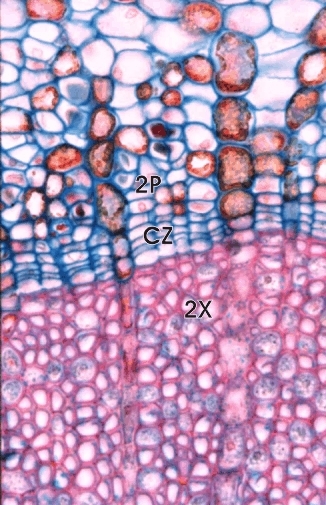 The cambial zone shown in some detail in the micrograph on the right, has produced files of secondary phloem (2P) and secondary xylem (2X).